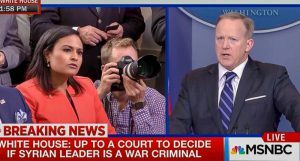 Washington editor of Harper’s Magazine, Cockburn said today: “Behind the mumbling, [White House spokesperson] Spicer is basically reiterating mainstream media/neocon policy (though neocons prioritize overthrowing Assad over destroying ISIS, if they care about latter at all. )” Cockburn’s latest book is Kill Chain: The Rise of the High-Tech Assassins. McAdams is executive director of the Ron Paul Institute for Peace and Prosperity. McAdams said today: “Spicer is saying the truth inadvertently. U.S. policy has been to destabilize Syria since at least 2011.” McAdams noted WikiLeaks documents which show the U.S. seeking to destabilize Syria in 2006. See: “WikiLeaks Reveals How the U.S. Aggressively Pursued Regime Change in Syria, Igniting a Bloodbath” by Robert Naiman. McAdams added: “There is a confluence of interests between the U.S., Saudi Arabia, Turkey and Israel who want to either overthrow the Syrian government — or ensure an enfeebled country, possibly even partitioning it. Then there’s the whole pipeline issue. “This has been led by the ‘neocons’ who seek to remake the Mideast while turning it into a graveyard. Sadly, you have many still gullibly accepting propaganda, as with this latest gas attack. The president launched 59 missiles against a sovereign country without providing evidence.